Looking for the best guesthouses & hostels on Koh Rong or Koh Rong Sanloem? Koh Rong has no roads or ATMs and most of the businesses and guesthouses only have electricity after dark. In exchange, you get a paradise island with 43 kilometers of beautiful beaches. It’s developing quickly, the number of bungalows and even purpose-built accommodation on the island is multiplying. When booking via Booking.com you can pretty much always book in advance with free cancellation. A lot of these Koh Rong Hostels, hotels and guesthouses are very popular so it is wise to book a few days ahead. Koh Rong has loads of simple bungalows and room and they are located directly on the gorgeous white sand beaches. 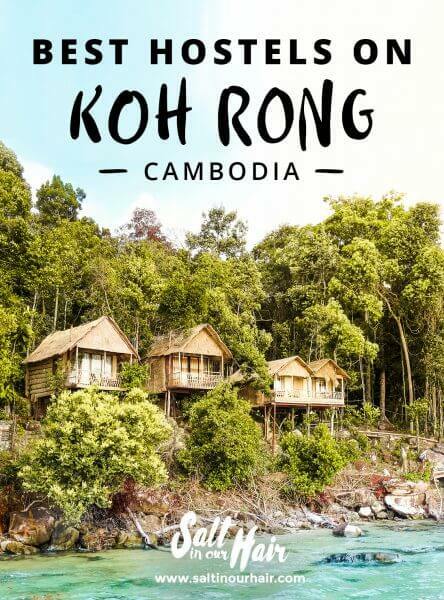 Guesthouses and hostels on Koh Rong are just a bit more expensive then you’re probably used to but you will be over it once you’ve seen this Koh Rong Island Guide. Staying in a tent for $5 on this location! Located a 30 to 40-minute walk from Koh Toch Village, Long Set beach offers is a more old part of Koh Rong. The white sand beaches are still undeveloped. North of the popular Koh Toch area, these beaches and village are a more chilled-out experience on Koh Rong. Starting at $10 a night! Away from everything and the a tiny island Koh Bong Poun. Popular place starting at $8 a night! Koh Rong Sanloem is paradise for every backpackers and luxury traveler, each part of the island has its own own unique island style. These are the Koh Rong Sanloem hostels and guesthouses. We had to show you these beau-ti-ful hotels on Koh Rong. Located near Koh Rong. We can't afford it haha.